My friend, Harry, has gotten himself possessed. Yes, possessed. Possessed by a sorority girl. 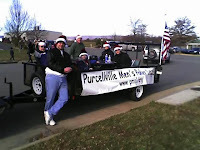 I'm not sure how, but a Zeta Tau Alpha has taken up residence in his body, and that is why I found myself sitting in 20 degree weather, on a float in the Purcellville Christmas Parade. 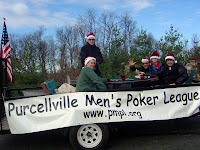 Yes, Harry decided it would be cool to register a float for our poker team, the Purcellville Men's Poker League, or PMPL (pronounced, very eloquently, as "pimple" for short). 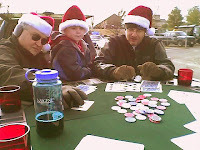 He got banners, and elf hats, and a trailer, and soon, we all found ourselves rolling down Main Street playing a few rounds of dealer's choice poker. 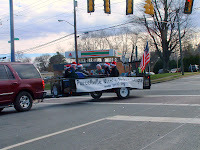 Next year, though, let's do the July 4th parade. My feet are still thawing out. BTW, any issues with converting to the Blogger beta? Glad you enjoyed it. Can't believe SP won so many hands. 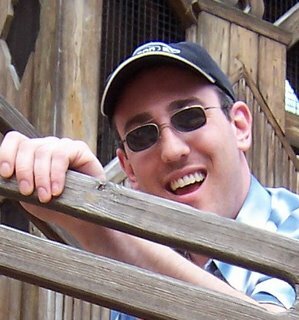 Harry: I'm getting major hits from your outdoorsbest.zeroforum.com forums. Hits are coming in from all over the country. 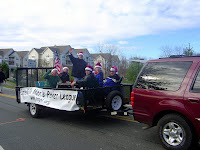 You're the best publicity my blog has had in a long time!